Lego Batman gets a butler. Tim Miller discusses which mutants could have been part of Deadpool. Andrew Kreisberg teases Cyborg Superman on Supergirl. Greg Nicotero thinks it’s unlikely a certain Walking Dead character will ever lose a limb. Plus, details on Rob Thomas’ new sci-fi show on The CW. Spoilers Now! The Red Queen appears in this brief teaser ahead of the release of the film’s full trailer. TV Line are reporting that the upcoming 6-part revival of the show could be a backdoor pilot to introduce a new spinoff series—starring Robbie Amell and Lauren Ambrose, who will play Agents Miller and Einstein respectively in the show. Fox were allegedly looking into producing the series as a way to keep X-Files going without having to rely on the presence of Gillian Anderson and David Duchovny, but have apparently shelved the plans for now. At the same time, the idea is still an option in the future. 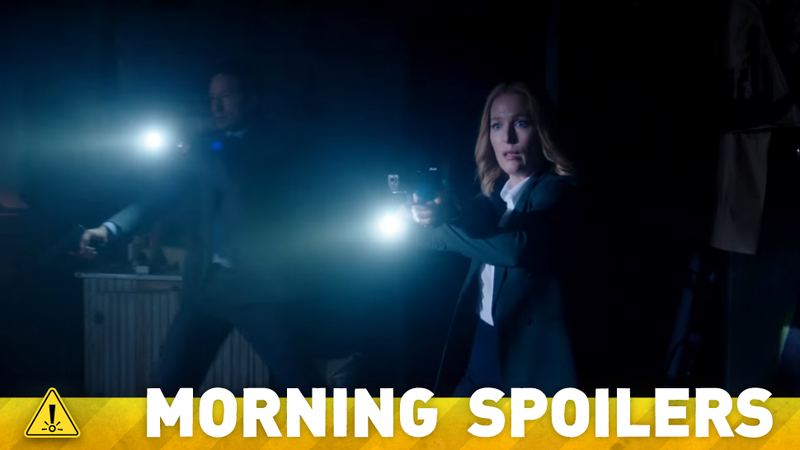 Speaking to the site at New York Comic Con, showrunner Chris Carter denied that either Ambrose or Amell’s contracts were negotiated with the potential for leading roles in a spinoff series—nothing beyond the current six episodes was—so for now, it’s best to treat this with a healthy dose of Scully-branded skepticism. We don’t want to say too much about it, because I think we had a lot of success with the way we doled out information about Tom Cavanagh’s character last year on ‘Flash’. For us, it’s so exciting to walk into every scene with him and not know is he there to help you? Or is he possibly there to harm you? That dichotomy and how it plays out is one of the most exciting, unexpected parts of the show. It was something we were actually going to do in the pilot, but we decided to wait. You know, it’s so funny... The whole Rick losing his hand conversation, [Andrew Lincoln] has told me a thousand times, “Listen, let’s just chop it off. I don’t know why he has a hand. I think it would be great.” I don’t think there was ever a time where we didn’t do it because we didn’t think it wouldn’t be great for his character but unlike Hershel’s leg where we were able to shoot long dialogue scenes between Hershel and Glenn and we didn’t have to worry about the visual effects of digitally removing his foot in every shot. With Merle, I designed this cool arm specifically to hide his stump. What we ended up doing was we did one shot where he took it off and showed the stump to Andrea and then he slid it back on. I think it would be very challenging indeed to try to deal with removing Rick’s hand from a technical standpoint. We’re looking to do original content on All Access and build up that platform. Netflix is our friend [and] a competitor. They compete with [CBS Corp.’s] Showtime. All Access will put out original content and knowing the loyalty of Star Trek fans, this will boost it… There’s about a billion channels out there and because of Star Trek, people will know what All Access is about. All the series have done well in terms of streaming. Added in to that, Star Trek is a huge international franchise. Our international distribution guy is going crazy; he can’t wait to get out to the marketplace and sell that. Right away, we’re more than halfway home on the cost of the show from international alone. The risk is small in seeing the track record. Luke Roberts, believed to be filming scenes at the Castillo de Zafra (widely-speculated to be filming flashback sequences for the Tower of Joy, where Ned Stark’s sister Lyanna was held captive by the Targaryens before the events of the books—and maybe even gave birth to Jon Snow there), has updated his CV to include a name for his character: Rowland Selwyn. Greg Germann has been cast in an undisclosed demonic role on the show, a character referred to as “The Distinguished Gentleman”. According to TV Line, the character is “a mysterious figure with god-like powers who is always clad in a perfectly tailored suit”. Season one of the show will follow Van Helsing as she leads the Resistance across the Wasteland, in the former America, in search of the hole in the sky in Colorado. First, they will have to find the scientist Klaus, who is the key to the mission, as it’s his device and knowhow which can harness the sun’s power. With Klaus, they will head to Colorado and hope the rumors are true, that the sun is as strong as a vampire’s bite. They will come across human fortresses and vampire strongholds- some friendly, most not. They will help those humans when they can, and they will kill whatever gets in their way. It will be violent and vicious, but Van Helsing is a warrior who is up to the task. Sheltered within are some of the most fearsome creatures of the universe… and Ashildr (Maisie Williams)! With a death sentence hanging over their heads, not all of the intruders will get out alive. Additional reporting by Gordon Jackson and Charlie Jane Anders. Image: The X-Files.